>For the first time in a few months I ventured to the pattern counter at our local fabric store only to be very pleasantly surprised that Simplicity now has a line of Cynthia Rowley patterns out! Oh my goodness, I’m in love with several designs and am really itching to make myself some new “everyday” clothing. I have always really liked Cynthia Rowley- she seems to take a lot of vintage elements and mix them in to her clothing designs. For example, check out the swimsuit and sarong dress from her Resort 2011 collection here on the Coveted Blog. 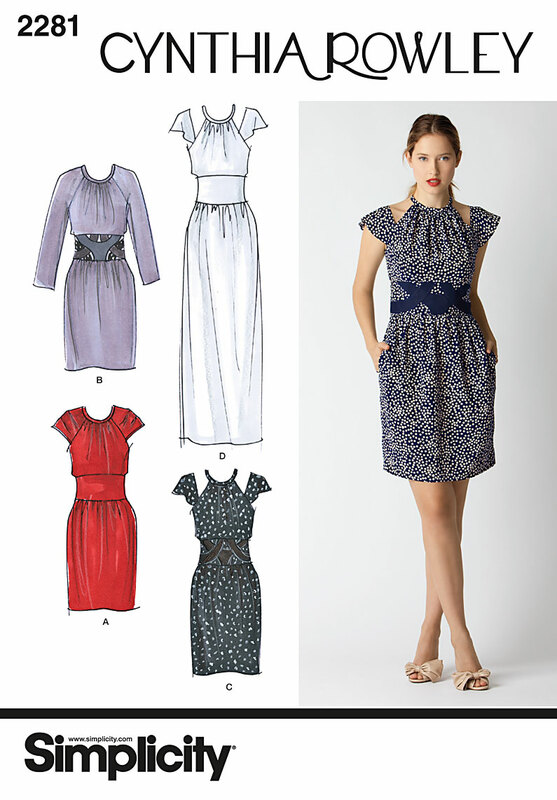 I was particularly taken with two patterns from the new offerings- the one shown here and another I can’t find an image of online- a very cute sundress with a full skirt and pleated bodice that was made up in a black and white stripe. I want to snag up the sample! But I would lengthen the skirt a bit since I’m a bit fussy about showing my knees. Of course, the chances of me actually making up the dresses is pretty slim, as I usually just ferret away patterns for a “rainy day” that never seems to arrive- even though it’s raining today… hmm… maybe a trip to the fabric store to use my gift card is in order. Do you have your eye on any new patterns right now? Or are any modern fashion collections catching your eye? >I'm actually going to the fabric store this evening to buy fabric to make your Smooth Sailing pattern. I'm terribly excited! I'll probably pick up stuff for a couple more projects but I'll have to see what inspiring fabric I find. >Guy Laroche's series of patterns put out by Vogue. The designer working for that house likes Women With Booty (and I qualify!) but also takes a lot of structural style elements from the late 30's and early 40's without it being so boxy. >I am just now getting into making regular clothes in my down time from making costumes. I Love these. I see several pieces I would make to wear to work and to play in. I'm just sad they weren't available during the Thanksgiving sales when I scored a boat load of patterns for $0.99 each!